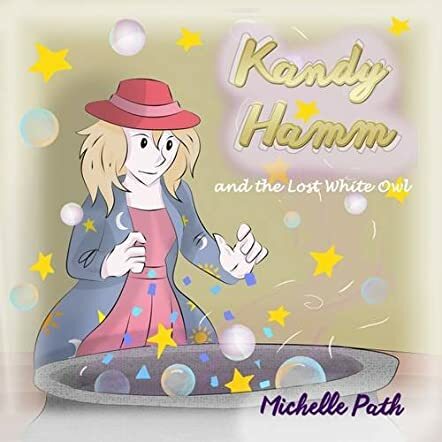 Kandy Hamm and the Lost White Owl by Michelle Path is a charming story revolving around the white witch, Kandy Hamm. She has been helping people with ailments and misfortunes ever since she set up her shop in the new cottage. Her business is booming and her lovely doll, Mandy, helps her when needed. On one of their adventures in the woods, Kandy and Mandy come across a forlorn man sitting on the porch of his house in a small clearing. The man introduces himself as the great wizard Starlight, and says that his white owl, Owlga, is missing, along with his powers. He asks Kandy to help him find his white owl before the celebrations for summer solstice begin. Will Kandy Hamm be able to help Starlight find his white owl in time? The story is filled with adventure, magic, fairy dust, glitter, and sparkle that will enthrall young readers. Though a witch, Kandy Hamm is one of those likable good witches who want to help other people. The illustrations are bright, colorful, and joyful, and they make the story and characters appealing to children. Youngsters who love magic and whimsy will definitely love Kandy Hamm, her doll Mandy, her horse Dreamer, Starlight, and Owlga. The other characters in the story are equally fascinating and will grab the attention of readers. I like the subtle messages of teamwork, helping each other, and being there during times of need that the author weaves through this delightful story. The book not only encourages reading habits in children, but also teaches them good messages which can be applied to their daily lives.